This summer was probably one of my most thought-provoking and inspiring both professionally and personally. From writing daily on my back porch to participating in and facilitating numerous virtual professional books clubs, to co-facilitating our first ever Lit Coach Connection writing group, this summer left me feeling rejuvenated and energized for a new school year. I’d been wanting to write about my summer experience but wasn’t quite sure how to capture it in a blog post until Shelley shared a TED talk by Eduardo Binceno entitled When Performing Gets in the Way of Improving. Binceno explains that the most successful people spend their lives moving between two zones: the learning zone and the performance zone. In the learning zone, the goal is to improve and concentrate on what we haven’t mastered. This is a space to try new things and make mistakes. After viewing his talk, I realized that this summer was so powerful because I spent it in the learning zone and I wasn’t there alone. I learned with others. 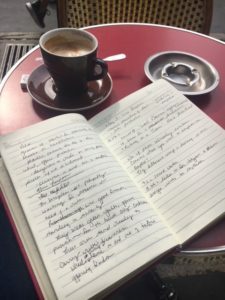 I began every day writing in my writer’s notebook and connecting with our Lit Coach Connection group, Connected Writing Teachers. Thanks to Google plus, our tribe included writers from Canada, Wisconsin, New Jersey and upstate New York. We posted our writing, shared resources and discussed our writing process as we explored Ralph Fletcher’s seminal work, A Writer’s Notebook: Unlocking the Writer Within. While we explored how this work informs our teaching, the greatest lesson was that living as writers offers the opportunity for self-discovery. Middle school teachers map out a whole-class novel. In addition to writing, I spend hours each week dutifully reading chapters and posting responses in Google communities as part of several virtual book clubs. I facilitated 3 groups with my colleagues from school. After weeks of thought-provoking discussion of Kate Robert’s latest offering, A Novel Approach: Whole-Class novels, Student- Centered Teaching and Choice, middle school teachers voluntarily devoted two precious hours on the day before classes began to map out one of their favorite novels, Touching Spirit Bear, by Ben Mikaelsen. Listening to my colleagues grapple with which scenes to read aloud to ensure that students felt the power of Mikaelsen’s words and the amazing evolution of the main character was exhilarating. 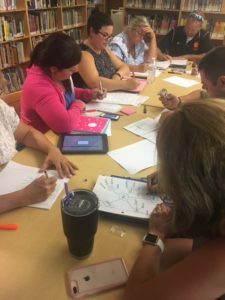 After admitting to feeling nervous about teaching in small groups, we made plans to collaborate and continue to be in the learning zone together this year. Another group of my school colleagues studied, Who’s Doing the Work: How to Say Less so Readers Can Do More by Jan Burkins and Kim Yaris. What amazed me was how honest participants were in their posts. They shared how this text made them rethink past teaching and make goals for the future. One participant even tried out and shared her experience with some of the moves during her summer tutoring. We shared ideas, problem solved and made plans to continue the work this fall. This experienced raised the level of our collegial discourse and increased our respect for one another. In her book, Literacy Coaching: Transforming Teaching and Learning with Digital Tools and Technology, Stephanie Affinito asks the reader to consider goals for coaching. 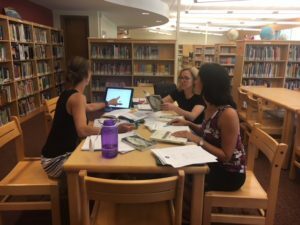 After a summer of learning with others, I immediately knew mine: to invite more colleagues into the learning zone. So for my opening day PD, I did a book talk of Be the Change: Lessons and Strategies to Teach Social Comprehension by Sara Ahmed, the text I read and discussed with the Cyber PD community. Sara Ahmed’s text shifted the ground from underneath me and touched my heart. I couldn’t wait to share it with my colleagues. After a book talk, I invited them to create identity maps. There was laughter and nods, as people named all that they are and all that they do. Ideas were shared. Connections were made. Almost every mom mentioned doing laundry and dishes with one teacher claiming the title “domestic engineer”. Some teachers used nouns, others verbs to define themselves. Another teacher shared that at first, her web consisted of on-the-surface nouns but as she kept writing, she went deeper. By the end, teachers asked for copies of the book and expressed interest in furthering this work with their students. This was such an inspiring post, Krista! You perfectly captured many of our conversations about learning alongside with teachers. We must be in that learning zone and invite teachers into it in genuine, authentic ways to connect together as learners. You last sentence with that beautiful quote is now on my office wall!